Another card that combines the Delightfully Detailed Laser Cut paper (sneak peek - it will be available from 1 June 2018) with a watercoloured background. I coloured this piece of Delightfully Detailed Laser Cut Paper with Blueberry Bushel ink (another sneak peek!) and a sponge brayer. 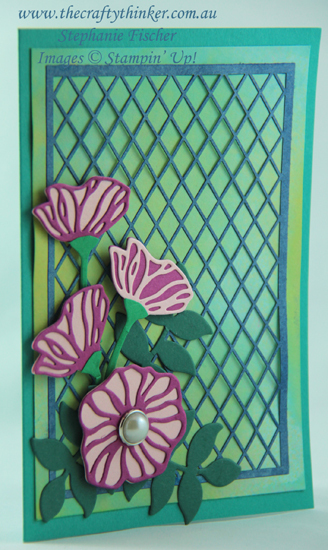 Since I have a tendency towards frugality - not wanting to waste any of that delicious ink - I placed a piece of Whisper White cardstock underneath before I started brayering and ended up with a lovely background piece that I used in this card. 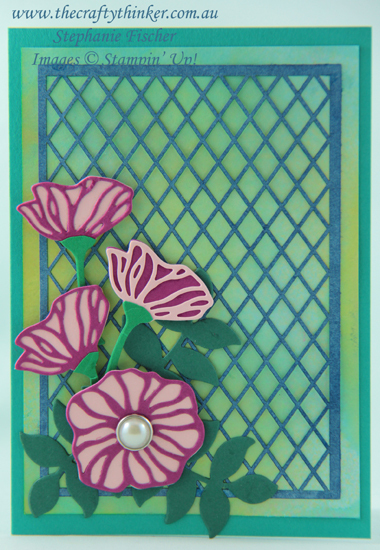 The flowers are made with the Eclectic Layers dies using Powder Pink and Berry Burst cardstock and the leaves are cut from Tranquil Tide cardstock. I'm so going to miss those elegant Metal Rimmed Pearls! They're available until 31st May or while stocks last.